Carrot is one of the most healing foods that provides the finest and highest quality in nutrients, especially from its juice. It is an excellent source of pro-vitamin A, vitamins C, D, E, K, B1 and B6. The known phytonutrients in carrots are lutein, lycopene, anti-oxidants alpha, beta and gamma carotenes, zeaxanthin and xanthophyll. You don't need to remember these fancy names, but just remember that phytonutrients are nature's marvelous provision for healing of various diseases. 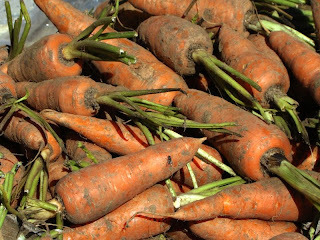 Carrots that are no longer than 6 inches tend to be sweeter. So choose the shorter variety if you like it sweet or the longer one if you prefer it less sweet. The most nutrients are concentrated just under the skin so try not to peel off the skin. To clean it, simply use a hard brush to brush the skin. Cut them lengthwise to preserve the nutrients as when cut in small rounds, they easily lose their nutrients in water when you wash or cook them. You may have heard of people "turning orange" from drinking carrot juice. It is not the carrot juice that is showing through the skin but is an overflow of materials which have been clogging the liver and are being eliminated with the consumption of carrot juice. This shows how effective carrot juice is at cleansinga good sign that the system is getting a good clean-up. When this "turning orange" happens, continue to take your carrot juice and the color will eventually go off as it cleanses. Acne: Its powerful cleansing properties are effective in detoxifying the liver, thus overall effective for acne which are caused by toxicity of the blood. Anemia: Carrot's molecules are closest to human's hemoglobin molecules, making it very beneficial in blood-building. Asthma: The anti-oxidants effectively protects the respiratory system from infections and free-radical attacks. Cancer: Studies show that adding one carrot per day in our diet significantly reduces cancer risks. Cholesterol: Pectin in carrots lowers the serum cholesterol levels. Congestion: Carrot juice is very effective in dispelling mucus from the ear, nose and throat area, easing nasal congestion, sinusitis, phlegm and mucus in the throat and other similar disorders. Eyes: Beta-carotene, lutein and zeaxanthin are some of the finest nourishment that helps keep the optic system in tip-top condition, with special protection against astigmatism, macular degeneration and cataracts. Fertility: One of the reasons for infertility is lack of nutrients and enzymes in your dietary. Carrot juice taken regularly is able to nourish your body back to fertility. Immune systems: It does wonders for boosting the immune system by increasing the production and performance of white blood cells; building resistant to various kinds of infections. Nursing mothers: Carrot juice helps enhance the quality and quantity of a mother's breast milk. Pregnancy: Drinking carrot juice regularly during pregnancy, especially during the last few months, will reduce the chances of jaundice in baby. No, you won't get an orange baby! Skin problems: The high quality vitamin C and other rich nutrients in carrot juice efficiently nourish the skin, preventing dry skin, psoriasis and other skin blemishes. Ulcers: The abundance of nutrient present in carrots help nourish cells that have been starved of nutrients which result in ulcers.